Home > Wine for Occasions > Which Wines for a Summer BBQ? The story of cooking meat slowly over fire – or in a fire pit – is almost as old as civilisation itself, but it’s a practice that faded in popularity in the Old World before being rediscovered and thoroughly taken on board in the New World. While the origins of the word barbecue have become shrouded in uncertainty, there’s no doubt that its popularity as a method of cooking - and especially entertaining - during the summer months is growing vigorously in spite of the damp weather with which we’ve been blessed over recent years. And it’s become traditionally a man’s domain, meaning that the man sits by the barbecue chatting to guests, occasionally turning over the meat that’s cooking itself, while the woman is kept busy in the kitchen preparing the salads, breads, desserts and accompanying side-dishes! You’ll both need a glass of wine after all that! But what is the right sort of wine to offer at a barbecue? Let’s get one thing straight: there isn’t a right sort! The wine you choose for your barbecue should be one that you enjoy drinking, not necessarily one that you think you should enjoy. Set the tone for a light-hearted and relaxed event. So if you love a glass of rosé on a summer’s evening, welcome your guests with a chilled dry rosé, which combines the crispness of white wine with the flavours of strawberry or watermelon. Perfect for a June afternoon. Or greet them with a glass of fizzy Cava. 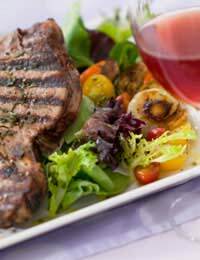 Chilled, pink maybe, it’ll add a touch of sophisticated fun to any garden gathering.Barbecued food should be slow-cooked and succulent; sadly, all too often it’s undercooked and charred! But in choosing a wine to accompany it, you need to consider how hearty the food is and what the dominant flavour is. Bearing in mind that both white and red wines can be light-, medium- or full-bodied, vegetables, white meat and fish are light in character and respond best to a sympathetic wine, while red meats can handle a more robust accompaniment. We’ll make some suggestions but remember, it’s your party and you’re supposed to enjoy it too, so choose what you’re happy with! Will go well with simple barbecued meats. Try a young Cabernet Sauvignon or a light fruity French wine made from the Gamay grape with fish or chicken, and for steaks, open a bottle of rich velvety Rioja – after all the Spaniards have had centuries to perfect their wines for hot weather food. A bottle of Sauvignon Blanc or another white wine with a high acidity content will go well with plain barbecued fare. Look for one that promises a crisp and intensely aromatic experience. For meat covered in barbecue sauce, you want a wine that won’t try to compete with the flavour but will complement it. A young fruity, spicy red would be ideal. Try a butch Australian Shiraz or a more traditional French Cotes du Rhone, which sometimes has a smoky aroma of its own. Or for a 4th July celebration opt for an all-American Zinfandel. If white’s your preferred choice, go for a German Riesling and Gewurztraminer. Their slightly sweet flavour should go nicely with the spicy sauce. If you notice that you’re running out of chilled wine, pop a bottle or two in the freezer for half an hour. Take them out and keep them in a bucket of cold water and some ice. Use cooler sleeves that are available at most off-licences. To keep a large number of bottles cool, three-quarter fill a clean dustbin with cold water and ice. Place the bottles in a bin bag and put the secured bin bag in the bucket.